As I’ve learned to tune-in and pay attention to the more subtle energies around and within me, I’m experiencing an entire new world of messages from the Universe. We’ve been trained since infancy on what to pay attention to in this world (and what to ignore). Because of this, we miss a lot. Lately, I’ve been paying attention – close attention to all the energy around me. I look at things longer than usual and rather than scan for the most “relevant” and cognitive information (like I was trained to do), I now look for the more subtle – I pay attention to how something makes me feel and follow the stream of vibrations that feel the best in those moments. This never fails to lead me into unexpected epiphanies or direct downloads from my Higher Self. I’m getting much better at seeing signs I’d usually miss – or am I creating them? I don’t really know. But I am noticing that the Universe (God) is communicating to me ALL THE TIME through the world around me – often in the most unexpected ways. 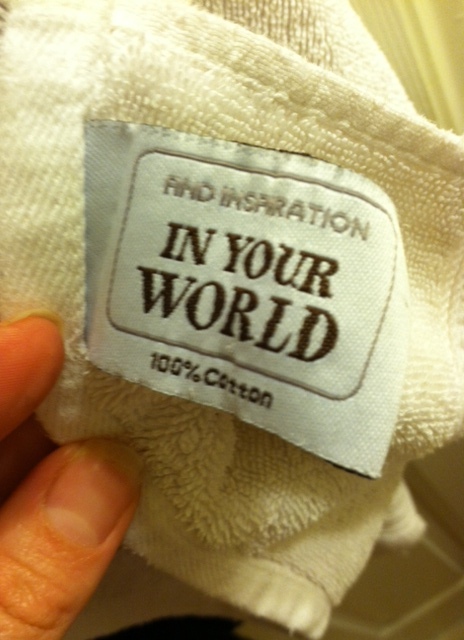 While taking a shower I noticed (for the FIRST time) a tag on a towel I’ve used at least 100 times “Find Inspiration in Your World” — this just happened to occur at the moment I was asking the Universe to help me find a way to express my creativity more. Later, the same day, while sitting on the couch (in a spot I have sat in at least a dozen times) I felt my inner-self still, the way I feel just before hearing the voice of God and I knew to pay attention. Only seconds before I had a fleeting thought run through my head “maybe I don’t really have much to offer the world…” but when the stillness came, I knew to pay attention. My eyes just happened to look down and I saw on the side of the computer (of all places) this sticker (which “apparently” has been there all along – though I’d never seen it – nor had my sister who bought the computer and set it up: “Beautiful. 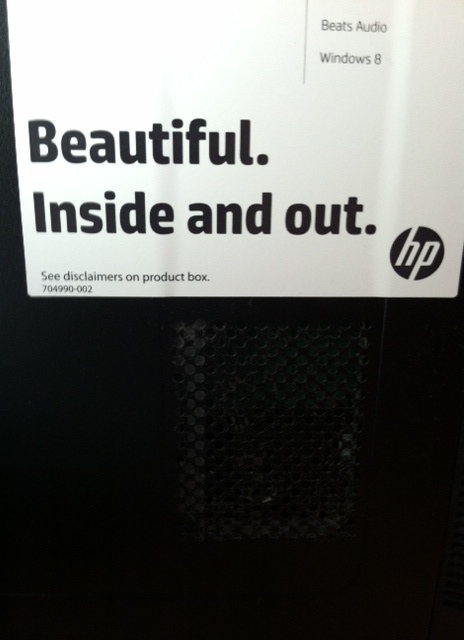 Inside and Out.” Since when has HP put that message on the side of their computers?! I knew it was the Universe, once more, speaking to me, in the most unexpected ways. Just before going to bed the same day, I was watering the Christmas tree and noticed an ornament that I had ne ver seen before. 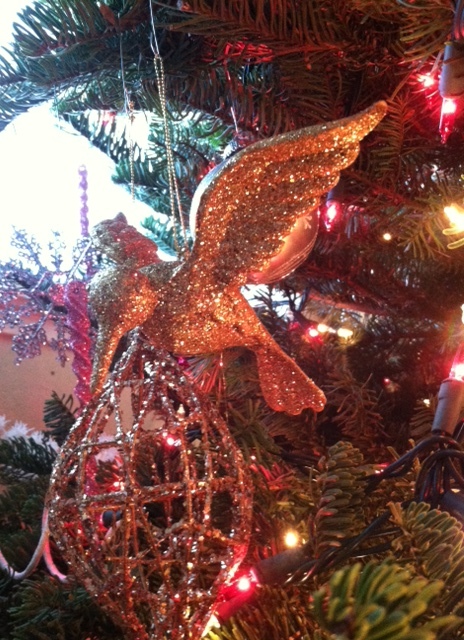 It was a golden, sparkling hummingbird, and I knew right away it was another message from Spirit (and the meaning of this one was clear, as hummingbirds represent being more present in the moment, independence, playfulness, and enjoyment of life). I love the way the Universe speaks. We know this Universe is one of vibrations. Anything you feel at any given moment WILL be reflected in a physical way through this hologram. The truth is, we could get any message we want to receive from the Universe, but why not ask/feel for the message that puts you into the greatest alignment with your Higher Self? And when the messages you receive don’t feel so good, remember it is only a reflection of an internal vibration. You’re not failing, you’re feeling. This is your learning tool. Use it wisely. Because of immense expansion this “Universal decoding” has given to my intuitive abilities, I decided to do a section on hearing and de-coding messages from the Universe in my Healing and Empowering the Emotional Body class. I think it’s one of the most fun aspects of being on this planet! How does this apply to someone dealing with illness? Thanks!. Amanda I’d like to tell you about an experience I had back in September. I found myself in a bad place emotionally as well as a series of events that basically left me faithless.I begun to use my knowledge of science to try to justify my belief in God.I felt myself sliding toward atheism and I was growing angry.Angry at the possibility of believing in something For so long that could turn out to be untrue. I decided that I was going to take my frustration out on the Internet. That I would comment where ever I could comment. If I couldn’t find faith, I would make sure others wouldn’t as well. Oh I had some statements written that would really make someone question their beleifs. I was ready to just let it all out. I was on the first Web page trying to comment. I was trying to write some nasty things but my smart phone kept misspelling words. It kept sending the curser back. I just couldn’t get a sentence out that made sense. The more I tried, the more things would happen. I was about to explode, I was so frustrated. I brought up another page, then another, the more I tried to type, the more my words and what I was trying to say didn’t make sense. Then suddenly I felt an energy move through me and I was overcome by feeling of extreme sorrow and guilt. My mind was blanked and my body grew suddenly weak. In my pitch black dark room, my smart phone lit up brighter than any light I’d ever seen. The phone was vibrating so intensely,it was unbelievable. I picked the phone up and looked at the screen. Words were shuffling around very very fast, as fast as my phone was vibrating. Sentences begun to form in front of my eyes. I was in awe because I knew I was in the presence of something much much bigger than myself and that my life from this moment on would never be the same. To me God equals the underlying principles of which the universe is built. Because the rules of which were either there initially or had to be learned. Either scenario is scientifical. The universe that is, God the creator. ← Happy Winter Solstice: Bring Back the Treasures of Darkness!